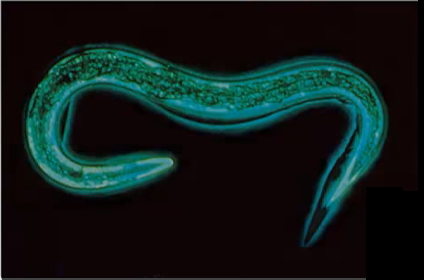 Beneficial Nematodes are microscopic, nonsegmented worms that occur naturally in soil all around the world. Once they are released, the nematodes seek out host insects and enter their prey through body openings, injecting them with paralyzing bacteria. The nematodes reproduce and their offspring feed on the insect cadaver and emerge to seek out new hosts. The endo-toxin generally results in death of the host insect within 48 hours. Nematodes are easy to use. They are shipped in a dry powdery clay formulation that is easily mixed with water. The solution can be applied using a watering can; hose end, backpack, or pump sprayers; or through irrigation or misting systems. Always release early in the morning or late afternoon when temperatures are cooler and away from direct sunlight to avoid exposure to ultraviolet rays and the drying effects of the sun. It is good to pre-moisten the soil before application and to water the area where application was performed afterwards. Soil should be moist, but not saturated. Nematodes can be stored in a refrigerator (do not freeze!) for up to 2 weeks, but it is best to use them as soon as possible, because they are somewhat perishable. If they start to smell bad, they're on their way out. Target Pests: Weevils, Beetle grubs, Japanese beetle, Masked chaffers, May/June beetles, Black vine weevil, various white grubs, Banana weevil, Bill bug, Colorado Potato beetle, Cucumber beetle, Sweetpotato weevil, Asparagus beetle, Carrot weevil, Banana moth, Citrus root weevil group, Sugarcane stalk borer, Various tree and vine borers, Bagworms, Flea beetle, Flea. Target Pests: Fleas, Codling moth, German cockroach, Asian cockroach, American cockroach, Fruit fly, Armyworm, Beet armyworm, Cucumber beetle, Artichoke plume moth, Cutworms, Sod webworm, Black cutworm, Mole cricket, Corn earworm, Cotton bollworm, Tobacco budworm and Leaf miners. Target Pests: Fly pests(fungus gnats), Plant parasitic nematodes, Humpbacked flies, Fruit flies, Raspberry crown borer, Leaf miners, Cabbage maggot, Cucumber beetles, Shore flies, Black cutworm, Tobacco cutworm, White grubs, Beet armyworm, Onion maggot, Subterranean Termite.